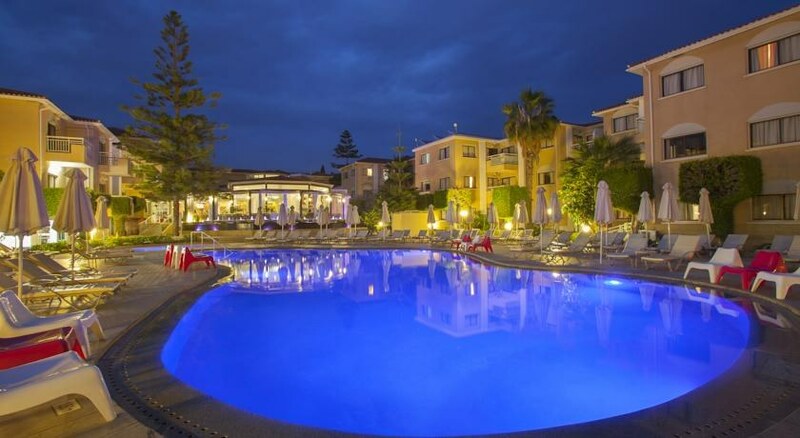 The King Jason hotel is a beautiful hotel with an exterior design which takes its cues from Cypriot and Greek architectural styles with its red-tiled roofs and Cypriot embellishments. The King Jason can be found in a quieter area of Paphos, surrounded by lush green gardens and only 11km from Paphos Airport. This little oasis makes for a great place for all the family to stay. 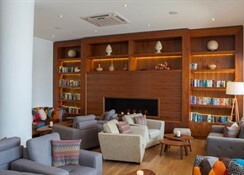 Whilst its design combines style and luxury it also provides convenience in both its facilities and central Paphos location. You’ll be within easy striking distance of many of Paphos highlights such as the Medieval Castle of Paphos, Paphos Archaeological Park and Tombs of the Kings. Children will love the nearby waterparks, karting centre and miniature golf as well as the kid's pool and playground. You’ll also be within easy access to great shopping, where a spot of retail therapy can be had at King’s Avenue Mall. 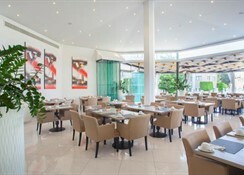 Great food and dining experience can be had at the Piatakia restaurant at the King Jason hotel itself, alternatively, you’ll be within walking distance from restaurants catering to a wide variety of international tastes, you’ll find Chinese, Japanese, Indian, Italian restaurants to name but a few. Located just 11km from Paphos International Airport, your taxi or shuttle service can have you checked in and to your room at the King Jason Hotel within half an hour. It’s quieter setting makes it ideal for a more relaxing getaway. Many restaurants serving local and international cuisine are within walking distance. The nearest beach is just under a mile away with its beautiful promenade stretching out into the sea. You can easily reach top Paphos attractions, including the Medieval Castle, Paphos Mosaics and Park Archaeological Park in a few minutes by car as they are only around 2 miles away. 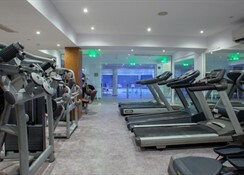 This luxury hotel boasts 78 studios and one-bedroom apartments all exceptionally well furnished, appointed and decorated. All rooms feature air-conditioning and central heating, T.V., hair dryer, full-equipped kitchenette and all the essential amenities you’d expect from a luxury hotel. You’ll also have access to your own private balcony and en-suite bathroom. Studio rooms generally occupy two adults with one double bed whilst the large one-bedroom suites can comfortably hold four adults with two double beds with both room types typically featuring a convertible sofa bed in addition. For those looking for a little extra luxury on their travels, then an Executive Suite could be for you with its open living area, premium quality bedding and extra privacy. The King Jason’s main restaurant, Piatakia, brings you both local dishes and those from around the world and is open for breakfast, lunch and dinner with a-la-carte snacks available between breakfast and lunch and an afternoon tea is offered between 3 pm and 5 pm. 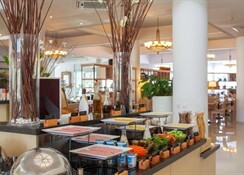 You can also be entertained by the live cooking demonstrations. 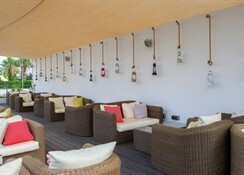 You’ll also find a pool-side bar serving cocktails and casual drinks. Away from the hotel, a quick wander will take you to a plethora of restaurants, whether you’re missing food from home or a favourite dish, there’s a little something for everyone on offer around Paphos. 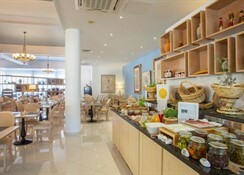 The local Tavernas are also highly recommended to check out, such as Kyra Frosini for an authentic taste of Cyprus. The King Jason Hotel makes for the perfect place to rest and relax. Choose from one of the many pools, there are six altogether, most of which serve a dedicated purpose such as the Centro Pool which features ‘dancing water’ in the evening and is great for all the family to enjoy, the Hydro Contact Pool with its hydro-massage areas and jets and the adults-only Elegancia pool is the perfect way to luxuriate, where you can even feel free to take in a glass of wine with you. Uniquely, The King Jason also sports a library for a peaceful way to read your holiday pick or choose from their selection, perhaps more uniquely for a library is the ability to choose from a range of drinks that are served straight to your table.